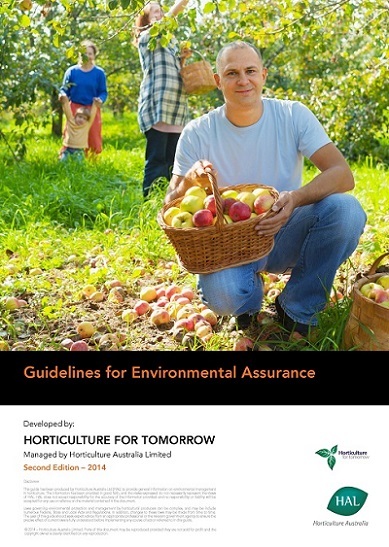 The Guidelines for Environmental Assurance in Australian Horticulture provide a mechanism for all horticultural producers to assess their level of environmental credentials and to develop a pathway for continuing to improve their on-farm environmental performance in an ever more competitive and changeable climate. Launched in May 2014, this second edition has been funded by HAL as part of the across-industry program. The Australian Government provides matched funds for all HAL’s R&D activities. The revision included consultation with existing system owners, industry stakeholders and relevant experts. There have been advances in this area since the first edition, including the development of tailored industry systems, changes to Government funding programs relevant to this area, retailer activity and increased understanding and appreciation of the importance of best practice as a means of addressing climate variability and future climate change. The first edition of the Guidelines for Environmental Assurance in Australian Horticulture was launched in 2006 with funding from the Natural Heritage Trust, through the Australian Government’s Pathways to Industry EMS Program, and managed by Horticulture Australia Ltd (HAL). The guidelines (1st Edition), developed over 18 months and comprehensively trialled by 190 growers and 40 industry experts across Australia, was the key output for addressing environmental assurance in the industry. What’s new in the second edition of the guidelines? An additional section on Climate Adaptation has been included within the second edition of the guidelines. Due to horticulture’s dependence on natural resources, especially irrigation, it is inherently vulnerable to climate change and variability. The new section outlines the potential impacts of climate change, the potential approaches for adaptation and highlights further resources that growers can access in order to consider their adaptation options.